With certain versions of Microsoft Windows there is a free tool called Snipping Tool. This tool can capture screenshots. Click on the Snipping Tool icon. 3. Click on the Snipping Tool icon. With a mouse: Open the charm bar by putting the mouse cursor to the top-right corner of the screen. With a touchscreen: Swipe from the right side to the left. Make sure you have “Apps” selected. 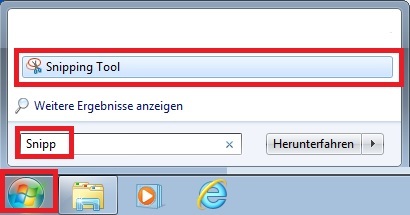 Start the Snipping Tool by clicking the icon. 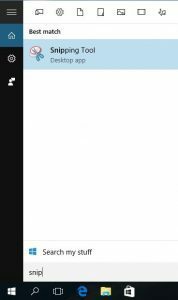 Windows will switch to the desktop mode. How can I print a ScreenShot? How can I start the tool automatically? There is no default option. You can add it to the Autostart group in Windows 7 and lower. For Windows 8, you need to go to Task manager and add a new Task in Startup. Capture Screenshot lite has a tickbox for that under options. Can I use the Print-screen button with the screen capture tool? Yes. But you need to click new-snip first, then ESC on your keyboard then Print Screen. How can I make a screenshot from a menu? Use the ESC trick from above and then Print Screen key.